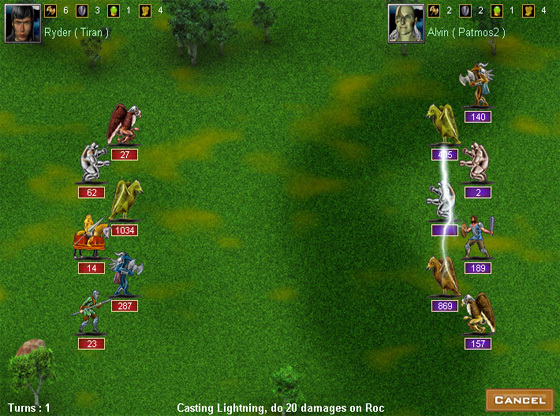 Empire Online II is a free online multi-player strategy game. In this game, you are a young monarch, must use production, construction, wars, diplomacy and all possible means to protect the country. You will be able to decide the country's destiny: suffers bullying, or gains a prominent reputation. Human and wizards coexist in this continent, every player controls a kingdom, striving for power and glory. ...... endless stream of goods and armies. Human and wizards coexist in this continent, as a monarch, you may have castles with different races. Extremely powerful creatures, such as golden knights, green dragons, and polar titans will fight for you. The time system of this game simulates the real world, it means that you may need a few months time to develop your empire, may also have to spend many days to gather armies, but all these are worthy, because it will give you the game play with unparalleled realism. Fortunately, even if you are offline, You loyal subjects still continue to produce resources for you, your heroes and armies won't stop the war too. Conquer or die, you have no other choice! Combines the most addictive elements from both genres. Qweas is providing links to empires online 1.510 as a courtesy, and makes no representations regarding empires online or any other applications or any information related thereto. Any questions, complaints or claims regarding this application empires online 1.510 must be directed to the appropriate software vendor. You may click the publisher link of empires online on the top of this page to get more details about the vendor.